In anatomy, the hip is the bony projection of the femur which is known as the greater trochanter, and the overlying muscle and fat. 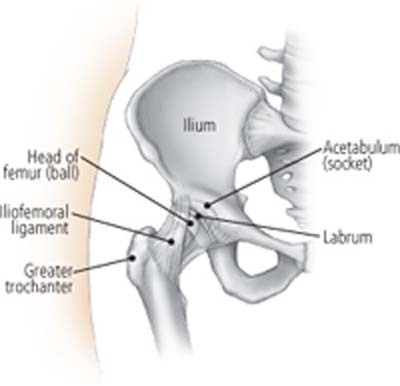 The hip joint, scientifically referred to as the acetabulofemoral joint, is the joint between the femur and acetabulum of the pelvis and its primary function is to support the weight of the body in both static (e.g. standing) and dynamic (e.g. walking or running) postures. Your hip is the joint where your thigh bone meets your pelvis bone. Hips are called ball-and-socket joints because the ball-like top of your thigh bone moves within a cup-like space in your pelvis. Your hips are very stable. When they are healthy, it takes great force to get a serious hip injury. However, playing sports, running, overuse or falling can all sometimes lead to hip injuries and require hip surgery. Our hips and knees bear our full body weight while allowing for an incredibly wide range of motion, making them susceptible to injury and arthritis. There are many types of hip and knee problems that are the result of sports injury, trauma or arthritis. However, playing sports, running, overuse or falling can all sometimes lead to hip injuries. Certain diseases also lead to hip injuries or problems. 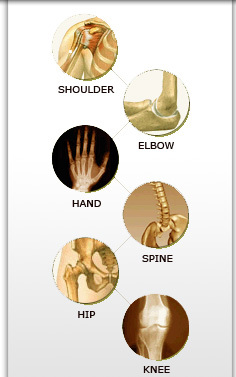 Osteoarthritis can cause pain and limited motion. Osteoporosis of the hip causes weak bones that break easily. Both of these are common in older people. Arthritis can affect the hip and knee joints, with the most common form being osteoarthritis. Osteoarthritis is a "wear and tear" type arthritis or joint destruction whose symptoms include pain, swelling, and stiffness. Osteoarthritis can affect people in their senior years, and can occur in middle age and in athletes.